As we know, multimedia files are linked to the PowerPoint presentation. The exception is the .wav audio file. This file can be embedded in the presentation! Positive: It is a part of the presentation, so there are no links to worry about. Negative: .wav is one of the largest audio file sizes, so the presentation gets much larger. 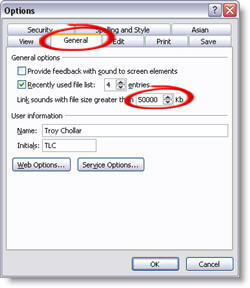 By default PowerPoint will embed a .wav file if it is under 100k – which is a very short audio file (1-5 seconds). You can increase the size PowerPoint will embed up to 50 MB. Go to: TOOLS >> OPTIONS >> GENERAL tab >> change the 100k to 50000k. Next, the exception to the rule. • What types of organizations do Presentation Professionals work in? • What areas of expertise and background do Presentation Professionals have? • Do you outsource your content development/delivery/overall communication strategy/technology/visual/graphic development, or do you do it in-house? How often does your organization contract with outside production firms for presentation development? • What types of challenges do Presentation Professionals experience today, and how concerned are they about these challenges? Find out by participating in InfoComm International’s Presentations Professional Survey. This online survey should only take you about 10 minutes to complete. To be sure your responses are included; please complete this survey by April 28, 2006. What are the “Other” Programs? – SnagIt: almost to many uses to list! There are plenty of screen capture applications out there, this one is my preferred because it does so many things, so easily. – OfficeFX, Professional: Moves presentations to the next level of visual dynamics and also has frame accurate video rendering. – Camtasia Studio: Used for everything from online video tutorials found on the TLC Creative website, to converting PowerPoint lectures to webcasts. – Articulate Presenter, Professional: a solid contender for converting presentations to a distributable format. – Flash: Big learning curve, but it creates things from custom elements in a presentation to specialized user interfaces for many of the conversion projects. – DVDIt! 6.0+: My choice for professional DVD authoring. – Vegas Video: My choice for professional video editing, which has become a large part of PowerPoint conversion projects. – DreamWeaver: Webcasts, login portals, download pages, etc. are all a part of distribution projects and Dreamweaver is my web development application of choice. – Magix Audio Cleaning Lab 10: probably the lowest cost software in the list and the newest addition to our arsenal of software. Professional narration and clean up of live video audio is a big part of many projects. Note: if you are looking for some more great tips & tricks, stay tuned I have been putting the finishing touches on a number of new tutorials and video samples that will be posted over the next few weeks! – CD mastering, for duplication. – Autorun User Interface program development, for interactive CDROMs where a custom application gives users the option to view, install or edit presentations. – DVD menu development, for interactive DVD menu’s and special options such as looping movies and custom playback hierarchies. – Professional DVD mastering, so they actually work on consumer players. – Web development, for converting presentations to webcasts. – Web hosting, for presentations converted to webcasts. I really enjoy the projects that are continuously flowing in. One reason is the variety; different clients, different visual needs, different requests. But as I look back over just the past 6 months or so, the big difference has been the variety of output needs. All of the projects revolve around PowerPoint, but PowerPoint is just the stage for creating the final product. I have some thoughts on that, but I will save those for later. 1. Convert a PowerPoint presentation and provided video clips into a technical training DVD. Playback on consumer DVD, distributed around the world to train employees of a major Cruise line about the new safety doors and gangways being installed. The PowerPoint slides provided the technical content. Video clips demonstrated each step of the process. 2. Sync PowerPoint presentation with live video taping of presenter and convert to an online webcast. 3. Convert a PowerPoint presentation into a kiosk mode display for a tradeshow booth. 4. Convert a themed countdown timer presentation to a movie format for playback from a beta tape. 5. Create a themed announcement presentation (company logo, press event time, company slogan, press event time, etc.) into a looping DVD. Only the DVD was left running in between events. Of course over the same months we have had plenty of the traditional speaker support presentations, templates, custom animation and clean-up projects too. But the world is changing and from my perspective the way PowerPoint is being used is evolving too! Read all the info here. A few weeks back I showed a fun interactive graphic of “my office.” Well I received a few emails asking what the stage looked like that all of the computers were used for. So, the page has been updated with a bit larger images and a photo of the staging – hope it all makes more sense now! See it here. For a recent PowerPoint training session my co-instructor and I put together this list of 20 items to verify before a speaking engagement. This is from the technical standpoint, because nothing is worse than getting up to speak and having a technical issue (except of course not practicing your material). Download the “PreShow Checklist” here. Matching a font from an image is just no fun. But it needs to be done for many projects and here is an online tool that might be of help. Go to What the Font? and follow the online directions. I used SnagIt to quickly create a few .jpgs of written text in various fonts, which I uploaded to What the Font? and ran them through the system. While many, such as the one above, did not come up with a match – many did. While not the perfect solution to a troublesome chore, it is worth a shot!